central line-related bloodstream infections in very low birth weight (VLBW) infants. Design: Multicentre quasi-experimental study, with a before and after design. A multidisciplinary coordination team will design evidence-based improvement tools and implementation and evaluation procedures. Facilitators in each neonatal intensive care unit (NICU) will create local teams to lead the implementation. During the pre-intervention phase, the registration of bloodstream infection episodes in the NeoKissEs System will be ongoing. Subsequently, a phase of stepwise implementation of the interventions will be launched in the NICUs. Finally, there will be a post-intervention evaluation phase. Main outcomes: rates of catheter-associated bloodstream infection (CABSI) per 1,000 days of use of a Central Vascular Catheter (CVC); cumulative incidence of VLBW infants with at least one episode of CABSI or sepsis. Other variables: incidence rates of nosocomial sepsis or bacteraemia (NB), necrotising enterocolitis and other complications; degree of implementation of intervention components; and barriers to and difficulties with the implementation. Study population: inclusion criteria: VLBW (≤ 1,500 g) infants of any gestational age, admitted to participating NICUs at less than 28 days of age and for at least 72 hours. Exclusion criteria: weight > 1,500 g at birth, or death, discharge or transfer to another centre in the first 72 hours of life or 72 hours following admission to the NICU. Analysis: segmented linear regression models on continuous interrupted time series adjusted for autocorrelation and seasonality, as appropriate. Standardisation by birth weight, gestational age and level of complexity of the NICU through multilevel analysis. Description and synthesis of relevant scientific evidence. Examination of factors related to the extent and success of implementation. Leaders of the overall administrative, logistic and scientific management and coordination. Undertaking a literature review of the efficiency of sequential bundle interventions related to vascular catheters. Developing teaching material suitable for developing the skills needed for the structured implementation of measures for the handling of catheters and prevention of infections associated with their use and making this material available to the NICU facilitators and teams. Supporting the teams in resolving concerns and problems in the introduction of the interventions monitoring of the process of implementation, and evaluation of teaching, skill development and accreditation processes for NICU staff, as well as coordinating the evaluation system. 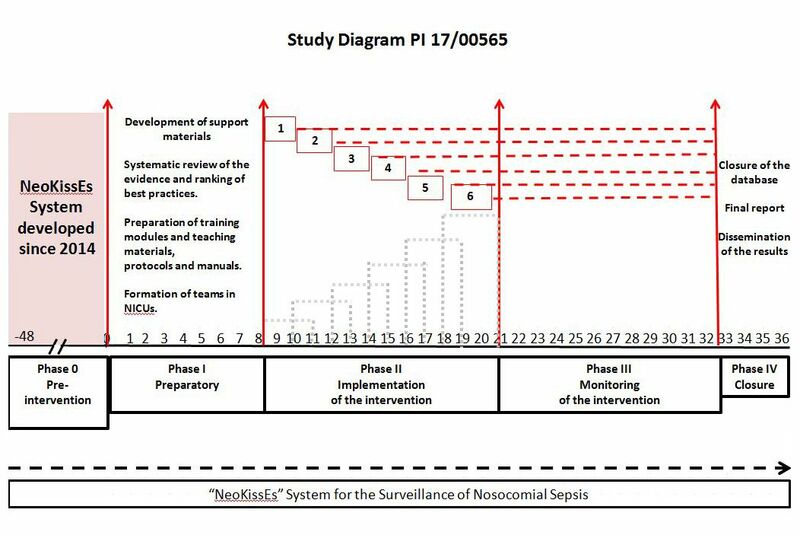 Continuously monitoring the incidence of NS and CABSI based on the NeoKissEs surveillance system. Making regular contact with the NICUs participating in the project, principally through the project’s website. Coordinating the preparation of reports, press releases, scientific papers, etc. They will be responsible for implementing the intervention for preventing CABSI in their NICU, coordinating all the training activities, monitoring of the completion of tasks related to the intervention, and the registration of cases in the NeoKissEs surveillance system. They will form and lead the implementation team, ensuring that the rights and wellbeing of participating infants are safeguarded and that the study data are accurate, complete and consistent with the source documents, as well as adherence to good clinical practice. They will be the contact persons between the project coordination team and their NICU and will participate in a meeting at the time of launching the intervention and in regular teleconferences with the coordination team. They will check the material prepared by the coordination team and suggest changes and adaptations thereof to their local context should they be necessary/appropriate, having explained and discussed any such changes with the coordination team. They will check the systematic review and reports and participate in the drafting of scientific papers. Development and updating of the current website for the NeoKissEs surveillance system, which was created in 2014 with funding from previous research (PI13/00587). This work will enable the website to accommodate the training modules and catheter surveillance data, as well as allow the ongoing electronic registry of patient data and episodes of NB and CABSI, indicators, surveys, queries and data export. Purchase of licences: for multiple users of a clinical research project management platform, for the overall management of the project, for the generation and administration of electronic surveys for the project, and for the creation and edition of databases, as well as data export activities. Organisational support and preparation of materials for intervention launch meetings and for consulting in relation into the resolution of problems in the implementation and follow-up phases.